During some internet research on Col. Budd J. Peaslee, first commander of the 384th Bomb Group, I was sidetracked by an interesting and unusual report from the second Schweinfurt raid of October 14, 1943, which is commonly referred to as Black Thursday. The 384th Bomb Group put up three squadrons (twenty-one aircraft assigned) on that mission. Five aircraft aborted, five were unused spares, six were knocked out by the enemy and failed to return, and three were lost due to bad weather over East Anglia when the crews, unable to locate a suitable place to land in England, bailed out and abandoned them to crash. Only five completed the mission and four of them landed at other airfields. The only fortress to make it back to Grafton Underwood that day was 42-30026, Battlewagon. Squadron Commander George Warren Harris, Jr.
Ball Turret Gunner Kenneth Mitchell McKay, Jr.
*Note: Richard Vance Wolf was the Algar crew’s co-pilot, who flew as an observer in the tail gunner position when the crew led the mission. One of the results for my search on “Col. Budd J. Peaslee” was a book written by Martin Caidin titled “Ghosts of the Air: True Stories of Aerial Hauntings.” The book is available on Amazon and you can see a preview of it here. Chapter Two is “Black Thursday.” It recounts the mission and quotes Budd Peaslee several times. It also recounts the unusual and mysterious appearance of the silver discs on the bomb run. At this moment the pilots and top-turret gunners, as well as several crewmen in the Plexiglas noses of the bombers (gunners and bombardiers), reported a cluster of discs in the path of the 384th’s formation, and, closing with the bombers. The discs in the cluster were agreed upon as being silver-colored, about one inch thick and three inches in diameter. Caidin continues the description of the phenomenon, bringing fortress 42-30026, Battlewagon, with Commander Harris and the Algar crew on board, into the story. Boeing B-17 Number 026 closed rapidly with a cluster of discs. The pilot jinked the aircraft violently, attempting to evade an imminent collision with the discs. The sudden and violent maneuvering of the B-17 proved the maneuver futile. The intelligence officers pressed their questioning. The pilot stated further that one of the discs was heard to strike the tail assembly of the airplane. Neither the pilot, nor any member of the crew that heard the disc striking the tail, felt or witnessed an explosion of any kind. The pilot explained further that about twenty feet from the discs – a report confirmed by other pilots and crew members – they watched a mass of black debris of varying sizes, in clusters of three by four feet, floating past their aircraft. 348th Group reports a cluster of disks observed in the path of the formation near Schweinfurt, at the time there were no E/A [enemy aircraft] above. Discs were described as silver colored — 1 inch thick and 3 inches in diameter. They were gliding slowly down and very uniform cluster. A/C 026 was unable to avoid them and his right wing went directly through a cluster with absolutely no effect on engines or plane surface. One of the disks was heard striking tail assembly but no explosion was observed. About 20 feet from these disks a mass of black debris of varying sizes and clusters of 3 by 4 feet. Also observed 2 other A/C flying through silver discs with no apparent damage. Observed disks and debris 2 other times but could not determine where it came from. For decades, this story has been the subject of UFO writers. Nowadays, Andy Roberts reports that the objects are thought to have been either a new type of flak being used by the Germans, a colored flak that threw off unusual fragments, or something dropped by the Germans in an attempt to disrupt radar or radio communications among air crews. I can’t even begin to speculate what the silver disks were, but I can see what happened to a 384th Bomb Group crew who flew through a cluster of them. I haven’t seen any other discussion about the silver discs include any information about that crew, but here’s what I found. 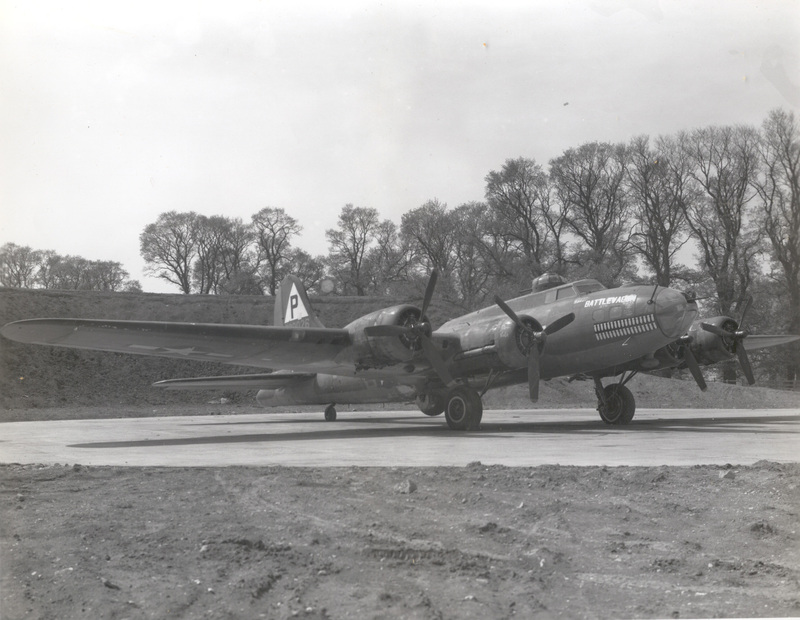 After flying through that cluster of silver discs, Commander Harris and the Algar crew were the only 384th Bomb Group crew to return to their home base at Grafton Underwood that day. On May 19, 1944, after nineteen missions, Squadron Commander George Warren Harris, Jr. was promoted to Major. He retired as a Lt. Colonel and was awarded the Distinguished Flying Cross and the Air Medal with two oak leaf clusters. Harris died in 2003 at the age of eighty-six. The other members of the crew aboard Battlewagon on Black Thursday all completed their tours. Every one of them. 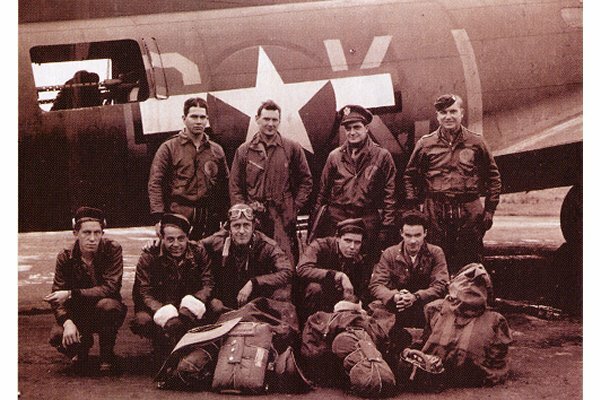 The Algar crew flew the 384th Bomb Group’s first mission on June 22, 1943. They beat the odds and survived WWII. That was quite a feat for an air crew in the early days of the European theater. Oh, and the Battlewagon? She, too, survived WWII. Her last mission was on April 25, 1944 and then she was returned to the US. By thearrowheadclub in 384th Bomb Group on August 24, 2016 .